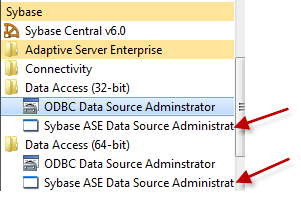 Hi, I was getting that nasty error message, although you could test the OLEDB connection from the Sybase “data source configuration” and gets a success notification!! I also made sure that the OLEDB connection are there and configured well under 32 BIT and 64BIT, and the Sybase “data source configuration” gives a success message when I test them. As Sybase ASE 15.5 was installed on my root drive C:\ and I’m using win & 64 BIT. I'd the same setup and configuration working on a vista 64 bit, but found other posts online about the driver and it is working well on windows 7. Error at LookupMedFrequency [Connection manager "CareCast"]: SSIS Error Code DTS_E_OLEDBERROR. An OLE DB error has occurred. Error code: 0x80040E19. [ASEOLEDB]Data source not found and no default driver specified". 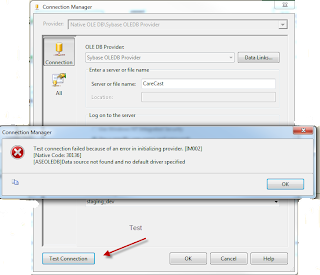 Error at Data Flow Task [SSISERVisits ]: SSIS Error Code DTS_E_CANNOTACQUIRECONNECTIONFROMCONNECTIONMANAGER. 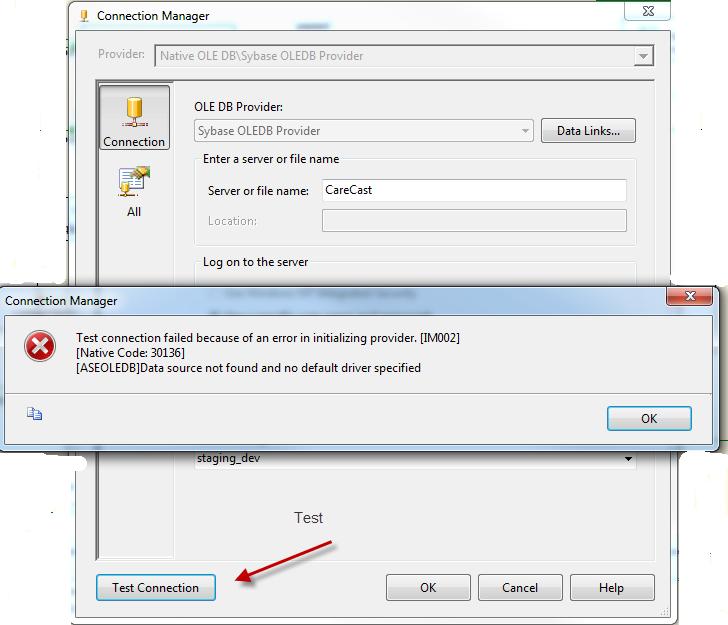 The AcquireConnection method call to the connection manager "CareCast" failed with error code 0xC0202009. There may be error messages posted before this with more information on why the AcquireConnection method call failed. I found out that the 3 connections that I created was created only under “DataAccess64\OLEDB\DataSources\” and wasn’t created under the “DataAccess\OLEDB\DataSources\” So I just copied the 3 files and the problem solved!!! I have same problem, and solved. Thanks...worked liek a charm ! Thanks and God Bless! I had the same problem and your solution worked like magic! How to enable GOD mode in win7 and Vista! Ever wanted shapes and check boxes in SSRS? Run a VBscript using SQL Server.